This morning I woke up thinking I must be one of the luckiest people I know. Perhaps luck has nothing to do with it and it all comes down to blood, sweat and tears. I am extremely thankful for all that is going on in my life. Scuba diving in 2 months! Zzzz ... man, I sleep so well at night. It's great to look back at all that has been built in the past 5 years. I'm feeling like a locomotive screaming down the track. Good things are happening in my life. For that I am extremely thankful. What are your ABCs of life? From closets overflowing with unworn clothes to boxes brimming with crafts and knickknacks, experts estimate that nearly 6 million Americans have a hoarding problem that affects their quality of life. Hoarding means acquiring too much stuff and not wanting to part with it. It can become quite severe and even dangerous, especially for people who live alone and have few visitors. When a person thinks there is nothing wrong with having a lot of stuff and it’s nobody else’s business anyway, it is very difficult for anyone to help—even family members, who become frustrated and discouraged. However, some people who hoard are able to recognize that they have a problem and need help. 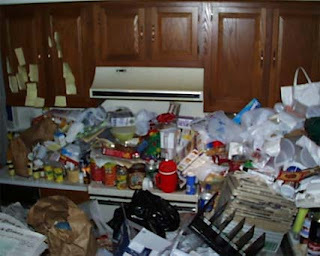 The Southeast Michigan chapter of the National Association of Professional Organizers has developed a program to help people who believe their hoarding is out of control but cannot afford to hire an organizer. The Community Hoarding Intervention Coalition (CHIC), organizers donate their time to help the hoarder regain control of the space and the habits that led to the problem. It is important to note that this program is only for hoarders with “insight" or awareness of the problem. Professional organizers are not licensed mental health professionals, so they are not trained to help people who cannot understand why changes are needed. Please contact me for more information about this new program. How are you helping people this year? "Mandy" had it with her closet. The shelving was coming off the wall due to poor installation, though her biggest gripe was the large sliding doors. They may look nice in appearance, but you typically end up having to twist and stretch to reach a portion of your closet because one of the doors is in your way. Mandy want something simple and easy to access. With her closet being in the entrance hallway of her bedroom, hinged doors would not work. The length of her closet is over 80 inches (200 cm), bi-fold doors were out, too. The current sliding doors had to go, too. Hmmm, dilema ... not really. When working with this problem, you have your facts/wishes. You also have your idea of the completed project. You've got the beginning and the end defined. You just need to connect the dots. In Mandy's closet, we knew the current shelving had to go. Along with the doors (yep, we removed the doors and tracks). Found a new home for her dresser. Installed new hanging rods supported by the wall studs and a new cubbie shelving unit. Mandy is going to pare down her shoes and return her clothes to the closet without the worry of it all falling down. Now you don't want to have your clothing closet open for all to see, plus it's bad bedroom feng shui. Mandy is going to have her mom make some fun fabric panels to hang on the decorative tension rod which replaced the bulk sliding doors. HOW FUN! Next time you are faced with a problem. Look at what you know and what you want ... get creative and make it happen. There is a solution to all problems. HUGE hurdle crossed in our home last night. Matthew and I had "The Talk." I knew it was fast approaching, having dodged a few pointed questions in the past couple months. Jacob was inside watching TV while Matthew and I were outside in our hot tub. Not sure when I'd be alone with him again, I went for it. All I could think about was when my mom told me. She and I were coming home from the grocery store and I was just mortified when she explained it. At the time, I had not heard anything about the whole process. I can't even recall how I thought the whole baby thing happened. "You mean you've got 3 holes?!" then I explained that point ... "That comes out of me?!" "Uh, I don't see any point in doing that until I'm married like 5-6 years." Matthew asked some really good questions, some were quite surprising. Once we started talking, the conversation seem to go very well. I pretty much stuck tightly to the facts and answered his questions in the fewest amount of words possible. Whew! Tough conversation, though thankful I had "The Talk" with him. Better to be a bit uncomfortable and open the door to discussion, than to hide from the topic and let schoolyard rumors educate your child. It may be a few weeks late, though its effectiveness is just as strong. This is one of my most effective tools in my success. 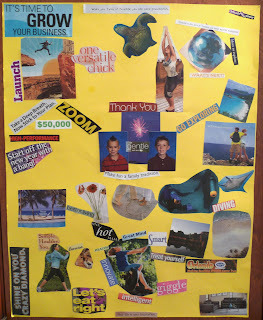 My vision board hangs in my bathroom giving me the opportunity to look at it at least twice a day. I encourage you to find a quiet moment and think about what you are going to accomplish this year. You don't have to create a poster. At least write it down and hang it in your bathroom. As a child, I remember spending hours walking through the neighborhood woods. Not sure my mom knows how often I did this. Thinking about it today, I probably would not want my boys walking alone in the woods. Even today though, one of my favorite activities is just walking and taking in the feelings of the trees, bushes and sounds of nature. 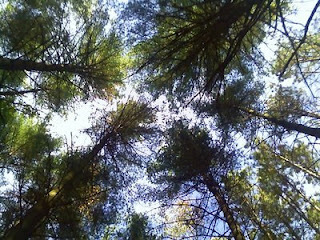 After watching " The Happening" and reading "Anastasia" from the Ringing Cedars series, I'm really beginnning to think that nature truly needs a bit of attention. It is a proven fact that all things emit an energy. Animals and children are especially sensitive to unexpressed emotions. "The Lorax" is one of my favorite books. I pretty much have it memorized. If you have not read it, you should. I wonder how the world would feel if we all took a brief moment and said hello to a tree. Give it a shot. What do you have to lose? Break into a little conversation with a tree, betcha feel a bit better after. Do I Really Need My Last 5 Years of Electric Bills? The IRS has 3 years from your filing date to audit your return if it suspects good faith errors. The 3 year deadline also applies if you discover a mistake in your return and decide to file an amended return to claim a refund. The IRS has 6 years to challenge your return if it thinks you underreported your gross income by 25% or more. There is no time limit if you failed to file your return or filed a fraudulent return. Many people view their statements online which is great, less shredding at the end of the year. You only need your annual summary for your records. Keep these until you close the account or retire. Keep only those related to taxes, business expenses, home improvement and mortgage payments. With online banking bill pay, use your monthly bank statments. You need the purchase/sales slips from your investments to show capital gains or losses. Once your utility bill is paid, you no longer need the bill. Unless you claim it on your taxes, then you keep it with your Tax files. For large purchase items (appliances, cars, furniture, computers, jewelry, etc), you need to keep for proof of purchase in event of loss or damage for insurance. Keep your receipts until your monthly statement and everything matched up (and you have decided you are not going to return the item). If there are tax deductions, then keep statements/receipts for 7 years. If your annual W-2 matches your information, then shred your stubs. If the numbers do not add up, then request a corrected form called a W-2c. Keep all records documenting the purchase price and costs for home improvements. Along with records of expenses in selling and buying your property. These items are added to the original purchase price, increasing your profit. When you sell your home, you can lower your capital gains tax with these records. What's the oldest paper in your files? Being humble is the defining characteristic of an unpretentious and modest person, someone who does not think that he or she is better or more important than others. The opposite of humility is pride. Finishing up the biggest month of my business I am beaming with pride for what my boys and I have achieved. I found it quite humbling to end month by helping the "Andersons" move their uncle from an assisted living apartment to a skilled nursing facility. Uncle "John's" dementia had progressed rapidly caring for himself and his 20+ year old cat was lost. As his sister, niece and myself walked into Uncle John's room, he had no idea we were going to tell him of this move. The family spoke to me about the poor state of his room, though I had no idea the extend until his door swung open. Like a thick brick wall, I was stopped in my steps. Whew! The smell and clutter of the room was quite bad. Quickly I was introduced and began to mention to Uncle John about moving to a new home. Not knowing how he would react, we were relieved when he thought the idea was wonderful. The plan was to come back the next day while Uncle John was out for medical treatment. Armed with masks, gloves, bags and boxes, we gathered up all John's personal items. His clothing was bagged to be washed prior to bringing to his new home. Sadly, his cat was taken to be put down. At Uncle John's new room, all his belongings were set into place. Freshing cleaned clothing ready for his arrival. The family was amazed at how quickly the move went and incredibly thankful for my assistance in making this difficult task easy for them. I am so thankful the Anderson's turned to me to help them with their uncle. Projects like this one remind me of the importance of helping people every day. How have you been humbled?